I cannot think of a bigger honor than to be invited to perform music at an event as personal as a couple’s wedding celebration. 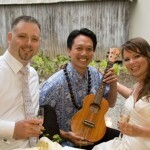 Hawaiian wedding music can include the ceremony (prelude, processional, recessional, postlude), cocktail hour, reception or all of the above. Andy is honored to bring a piece of Hawaii to wedding celebrations and be included as a part of your special day. Wedding music during your ceremony, cocktail hour, and reception sets a mood and reflects the style of your celebration. Your music selection can be a fun way to personalize your special day. While trying to pick songs that move or inspire you, it can be overwhelming with seemingly infinite choices. 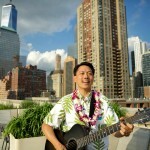 What an honor to perform wedding ukulele in New York. Katie and Scott’s wedding was my first time at the United States Merchant Marine Academy located in Kings Point. The ceremony was held at Mariners’ Memorial Chapel built to commemorate the sacrifices of the officers and men of the U.S.